NGC 3393: A Pair of Black Holes Hiding Right Under our Noses! It's great that the Earth's atmosphere blocks harmful radiation from space, such as X-rays, from reaching the ground - we couldn't survive without it! But astronomers would like to study this radiation because it gives them useful information about objects in the Universe, such as stars and galaxies. So what can they do? They launch some telescopes into space - to go beyond Earth's protective atmospheric shield. One of these telescopes, called the Chandra X-ray Observatory, is designed to detect X-ray radiation that has travelled across the Universe. The information that the telescope collects is then beamed down to astronomers on Earth to study and to create fantastic pictures, like the X-ray photo of galaxy M82 shown above. The astronomers behind the new discovery were surprised by how close this galaxy is to our own galaxy, the Milky Way. 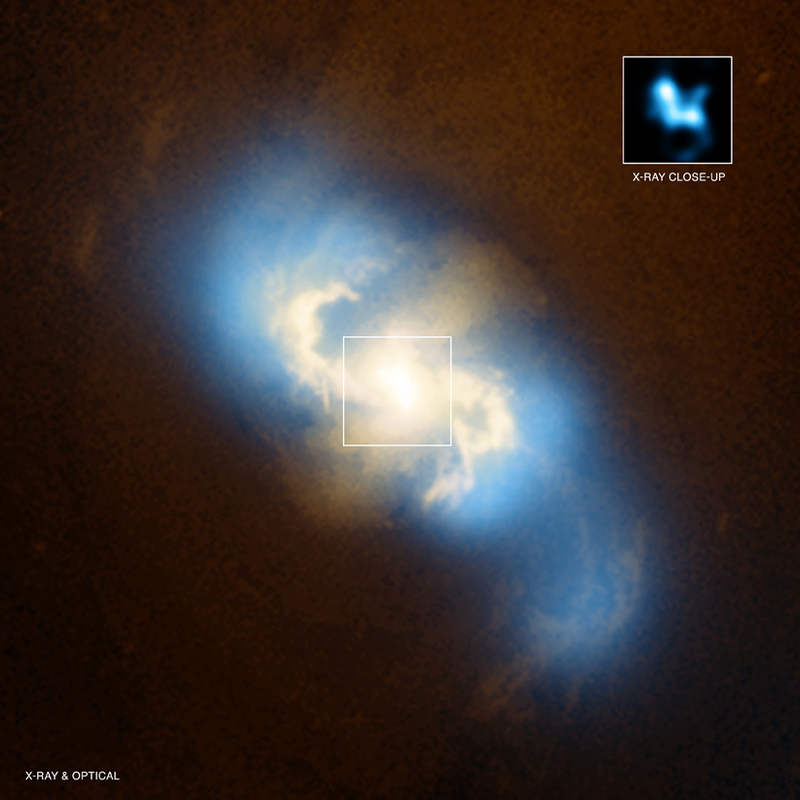 "This galaxy was right under our noses," says astronomer Pepi Fabbiano. "It makes us wonder how many of these Black Hole pairs we've been missing". Cool fact: With a whopping 14 meters (45 feet) in length, the NASA Chandra X-ray Observatory is the largest telescope ever launched into space!